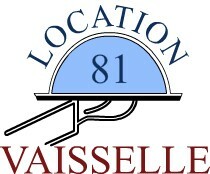 location-vaisselle81.fr site is published by SAS FRANCE GOURMET 81 is headquartered at 10B Street Peyregrosse THE GARRIC 81450, registered in Albi in the registration 751 875 543. The website is hosted by 1 & 1 Internet Ltd, whose registered office is at 7 place de la Gare - BP 70109 57201 Sarreguemines Cedex. Your information is intended solely for the SAS FRANCE GOURMET 81.